EVEN by its own aggressive standards, North Korea’s actions over the past couple of weeks have been extraordinary. Kim Jong Un, the country’s young dictator, has threatened the United States with nuclear Armageddon, promising to rain missiles on mainland America and military bases in Hawaii and Guam; declared a “state of war” with South Korea; announced that he would restart a plutonium-producing reactor at its Yongbyon nuclear site, while enriching uranium to build more nuclear weapons; and barred South Korean managers from entering the Kaesong industrial complex, almost the only instance of North-South co-operation. All this comes after the regime set off a nuclear test, its third, in February. Tensions are the worst on the peninsula since 1994, when North Korea and America were a hair’s breadth from war. The questions are what to make of all this, and how to respond. Neither is easy. The White House has tried to play down the aggression, talking of a “disconnect between rhetoric and action”, and some parts are pure bluster. The nuclear threat against mainland America is patently hollow: it will be years before the North has the technology to dispatch nuclear-tipped missiles. North Korea has yet to order a large-scale mobilisation of its 1.1m-strong army. Pyongyang, the capital, does not seem like a city that is about to go to war. But there are also depressing reasons to take Mr Kim all too seriously. It does not take much to imagine the cycle of provocation and deterrence getting out of hand, especially if South Korea and the United States misjudge North Korea’s actions—or vice versa. And even without nuclear missiles, conflict on the crowded Korean peninsula would be savage. Decrepit North Korea would certainly be outgunned by South Korea and America. But nobody should doubt the cult-like commitment of the North’s armed forces. The human cost of war would be huge: 1.7m men serve in uniform on the peninsula, and North Korean artillery batteries are trained on the megalopolis of Seoul. American generals guess that a conflict could kill at least 1m, including thousands of Americans. Oh, and it would also be curtains for Asia’s thriving economy. Moreover, Mr Kim heads a regime that cares nothing for its own brutalised people. Some 150,000-200,000 North Koreans—individuals and often whole families—rot as political prisoners in a vast gulag. Farmers are herded into collectives and forced into gruelling manual labour. Women trying to make a living by smuggling refugees across the border with China are shot if they do not know the right people to bribe. In some ways the North is even scarier under its new ruler than it was under his father, who died in 2011. Early hopes that Mr Kim might prove a youthful agent of change seem entirely dashed by his nuclear explosion and boundless bombast. He is thought to have ordered the sinking of a South Korean naval corvette in 2010, with the deaths of 46 crewmen, and the shelling of a South Korean island later that year. Whereas Kim Jong Il was practised in the calibrated calculation of shaking down the outside world, his callow son has escalated tensions wildly. Nobody knows how to walk him back from the brink. Doing so depends partly on Mr Kim’s motives. Perhaps aggression is a rite of passage to prove his leadership credentials to the country’s ancient generals. Perhaps he will shrewdly claim he has seen off the imperialist threat and back down. Perhaps he gets a thrill from orchestrating the chaos—as if he were playing a video game. Or, most worrying, perhaps he is out of his depth and therefore more prone to miscalculation. Whenever Mr Kim’s father ratcheted up tensions, at least the pretence held that a bargain was to be had. In return for aid, oil or respect, North Korea would agree to discussions over dismantling its nuclear-weapons programme. The process was often a charade, but it kept the North engaged and it probably helped slow the development of nuclear weapons, as with the agreement to mothball the Yongbyon reactor in 2007. Now Mr Kim has declared that his nuclear capability is non-negotiable. What should the West do? In the long term, the best way to destabilise Mr Kim is from within. A new merchant class is emerging—the only prospering bit of the economy. The world must redouble its efforts to engage with these and other possible agents of change. This includes teaching more mid-ranking officials how societies work when they are organised around market economies and underpinned by laws; and funding defector radio stations beaming news back into the North. That, though, is for the long term. The imperative now is to face down Mr Kim. After all, he has ruled out the only promise worth having (suspending his nuclear programme again). North Korea—and other rogue regimes and would-be nuclear proliferators, such as Iran—need to know that actions have consequences. That is why President Park Geun-hye of South Korea, in turn, was right to make it clear that sneak attacks will be met with a much firmer response than in 2010. America is right to move missile defences to Guam. When it sent two nuclear-capable B-2 bombers to fly over the peninsula it was a warning not only to North Korea, but also a gesture of support to the South. If Ms Park doubts American backing, she will be tempted to seek nuclear weapons herself. Now more than ever, America needs to cajole China to press for change in its satellite. Apart from humanitarian aid to the North’s stunted people, all other commercial favours towards the regime should be stopped. Sick of Mr Kim and his family racket, China signed up to fresh UN financial sanctions against North Korea after the latest nuclear test. China has the capacity to choke the most iniquitous sources of the criminal regime’s cash. Yet its commitment to enforcing the sanctions seems half-hearted and it appears to have insisted that Shanghai accounts in two of its biggest banks, holding hundreds of millions of dollars on behalf of Mr Kim and his cronies, be excluded from the sanctions. Attempts at changing North Korean behaviour have so far patently failed. But then, as China shows, not everything has yet been tried. Here are 5 People Who Succeeded Long After They Should’ve Quit. Robert Hooke was the Steve Jobs of the 17th Century. It doesn’t look like things are going to improve much in North Korea. North Korea makes it a war crime to use a cell phone during 100 day mourning period. Everything Lee Stranahan’s learned about business, he learned from playing Monopoly. Not that any of you need any more reasons to avoid swinging drug-fueled orgies with strange couples, but now you have one: bear mace. 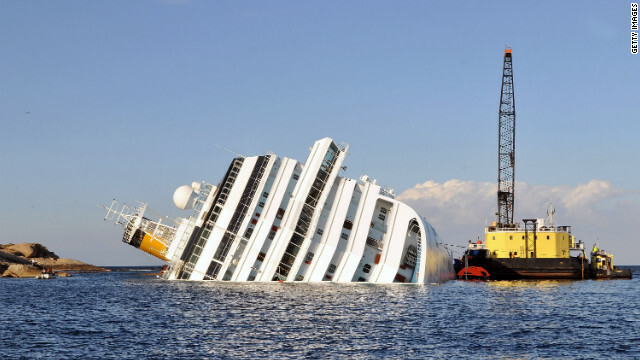 The Costa Concordia After Captain Ignored Both Maps and Procedures to "Wave at people"